I first noticed this was available a few weeks ago on Netflix streaming, but it did not immediately appeal to me. But yesterday it was named by both Boston Globe movie critics as one of the 10 best movies of the year, so I decided to watch. And in fact I watched it twice. Director Frammartino is based in Milan but is originally from Calabria (the "toe" of Italy). And the Greek philosopher and mathematician Pythagoras also lived in Calabria, where he started a religious sect that believed in reincarnation, among other things. And this seems to have been the inspiration for the director (who also wrote the "script"- the movie has no dialogue, or soundtrack). 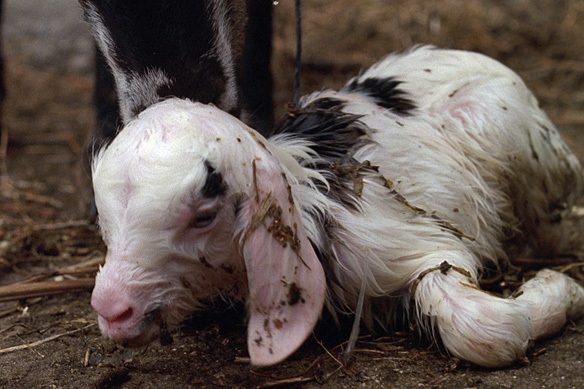 What happens in this unique film is that we start with an old goatherd who dies and comes back as a kid (in the photo), who then also dies under an evergreen tree; the tree is then chopped down and eventually the wood is turned into coal. The goatherd, the kid, the tree and the coal are the four times (le quattro volte). Further, the movie started with the superstitious old man mixing the sweepings from the church (presumably from burning coal from heating) into a drink for his ailing health, and the movie ends with the coal being sold for fuel in the goatherd's small town, with a final view of the smoke escaping the chimneys. An extra is the location in Calabria, an area little-known by tourists. The stark and rather forbidding scenery emphasizes the timelessness of the story and the difficulty of the generations who survived such conditions. Religion, from Pythagoras's beliefs to Christianity, with a good amount of paganism thrown in, is central to the work. Of particular symbolic importance are wood and wood crosses or cross-like structures. The movie has received well-deserved praise, from The New York Times to The Guardian, and elsewhere. While not a masterpiece in my opinion, it bodes very well for the future of director Frammartino, who is only on his second film. Highly recommended.